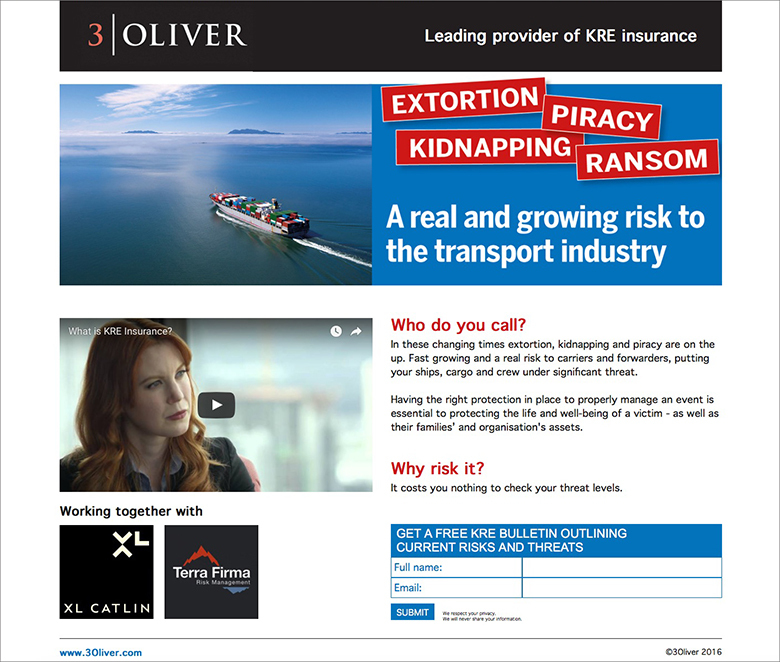 3Oliver is a leading provider of KRE (Kidnap, Ranson and Extortion), Data security and Piracy Insurance. This is a harsh area of Insurance so we needed to tread carefully with a subtle but direct approach! We designed and created a digital campaign showcasing their KRE product, firstly via an animated banner ad on theloadstar.co.uk (The Loadstar is an award winning multimodal online news resource for the logistics industry). In the ad we outline the dangers for shippers and forwarders in the transport industry with a play on rough seas and headline “Who will you call?”. The banner ad links to a landing page www.creativi.co.uk/3oliver giving more information on KRE with a form for data collection from potential customers.